The guy doing the mot commented on how good the brakes are, in fact my sons standard Honda VFR 750 brakes didn't get as high a reading when it was mot'ed in the same place a couple of weeks later. The seat cover was another job I did however I found the trim kept coming off at the front of the seat, this was fixed with a couple of rivets each side. 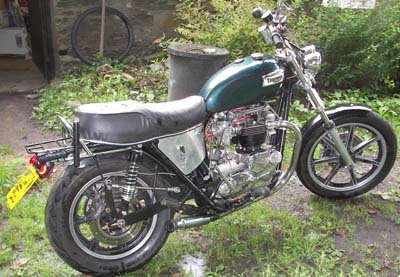 The Triumph engine runs sweet and its not nearly as hard to kick over as I expected. Its a tad lumpy at low revs, but I thought that would be the case with these camshafts fitted. 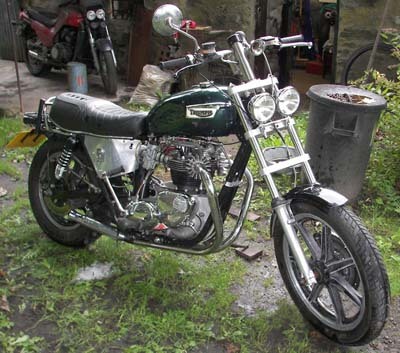 I'm still trying to get use to the four speed gearbox, I think it would run better with a few less teeth on the rear sprocket, I will probably drop about 4 or 5 teeth. 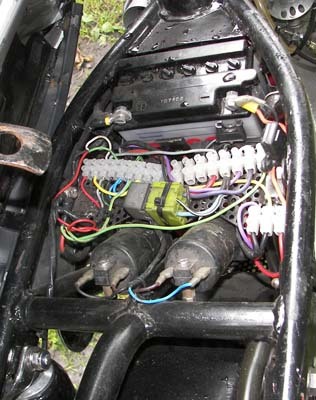 Below is a picture of the wiring under the seat I have use relays for full and dip beam. 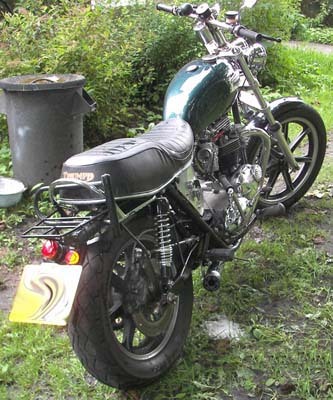 Kawasaki 550 coils power the spark plugs, which are a lovely tan colour. 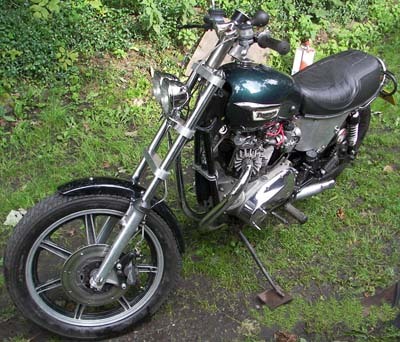 It is fitted with Boyer Branson electronic ignition. As you will see from the picture above I have also braced the frame across the top shock mountings and taken a brace to the back of the sub-frame. 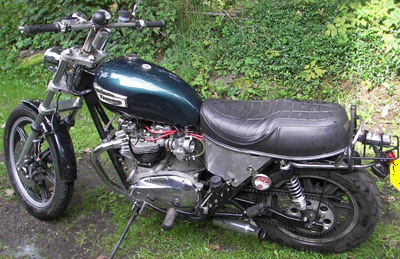 Well that's Project Triumph Bonneville 650 finished, if you would like to own it, contact me with any genuine and sensible offers over £2,500 I may consider a part exchange.